Reimagined Mobile Experience Hits the Streets! Like many of you, I was a big fan of watching TV when I was younger (still am, by the way). For some reason, there was a commercial tagline that has stuck in my head for more than 20 years. No, I am not referring to "Where's the Beef?" but rather a commercial from BASF that led with the slogan, "At BASF, we don't make a lot of the products you buy, we make a lot of the products you buy better." I admit, I still don't know exactly what BASF does, but that message has remained with me. In executing the Matrix product vision, the BASF slogan has continued to resonate with me and reflects our mission to make the media ad sales professional faster, smarter, and more efficient! Over the course of the last 18 months, we have introduced a number of new enhancements and modules designed specifically to enhance the value we deliver, but none more significant than our new and innovative Matrix Mobile experience. The demands on the media ad sales professional are changing - that’s a fact. With increased competition, more media outlets, automation, programmatic buying, and more, the salesperson of today and tomorrow needs to be more consultative than ever. And the sales tools need to help enable that, whether at the office or on the road. That's where Matrix Mobile comes in. We are excited to release our reimagined Matrix Mobile experience, primarily because the mobile experience delivers on making media ad sales professionals faster, smarter, and more efficient. 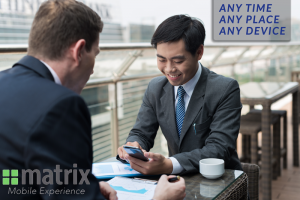 While we will continue to enhance and expand the functionality of our mobile solution over the course of our next several releases, the new Matrix Mobile will provide all of the core Matrix functionality in an easy-to-navigate and personalized experience. Matrix users will find the mobile functionality to be a substantial upgrade and time-saver while on the road. If you are not yet a Matrix customer, and you are reading this - what are you waiting for?! We set out to create a mobile experience that empowers media ad sales professionals before, during, and after every client interaction. We believe that sales tools should constantly maximize every customer experience and time spent out of the office is no exception. Check out our Matrix Mobile introduction video! There are many features designed to help users while on the road or on the go. Some of my favorites include the ability to get a quick "News Feed" on what is going on with your accounts before you head to a meeting, the ability to map directions to a meeting, quickly updating a deal or an activity, calling a contact directly from Matrix, and so much more. Additionally, all Matrix Premium customers can access your personalized alerts right on their phone! Stop spending time running reports, and devote more time taking action with alerts that are customized to your needs. I could go on and on, but I ask you take my word for it and try Matrix Mobile for yourself on July 25! You can also take advantage of one of our Mobile webinars scheduled over the next several weeks.